Mark Twain suggested “The political and commercial morals of the United States are not merely food for laughter, they are an entire banquet.” With politics occupying endless hours of cable news and mainstream blather, my blog takes you on the hunt for the fabulous “tree-climbing fish.” Read “Wait! Not All the Uproarious Farce is Recent!”, below. 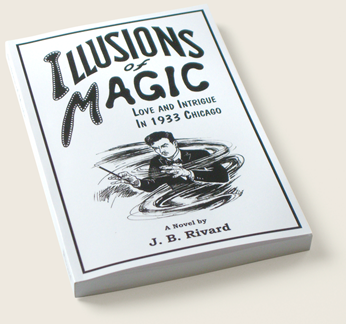 I’m happy to welcome JKS Communications to the Illusions of Magic team. Chelsea Apple is heading the effort to expand the book’s presence in Chicago. Also, someone mentioned they hadn’t read the book because they didn’t have an e-reader (Kindle, Nook, etc.). You don’t need one. There’s a FREE app on Amazon—below the book cover—that allows you to read on many devices, an ipad, iphone, a computer, etc..
Below, as usual, is “Wisdom with a Smile”, this time spinning some smiles derived from experiences with doctors and dentists. I hope you enjoy my blog. Please take time to comment, about the website, the blog, or any other topic. (Be sure to tell me who it’s from.) Simply send an email to: feedback@illusionsofmagic.com. Wait! Not All the Uproarious Farce is Recent! Here in the U.S.A., H. L. Mencken once said, elections are “stuffed with such gorgeous humors, such extravagant imbecilities, such uproarious farce” that endless laughter is the only response. We may suffer a delusion that the current political season offers the greatest demonstration of Mencken’s idea. However, back in early 20th century, William Hale “Big Bill” Thompson, an occasional mayor of Chicago, proved to be an endless source of mirth, if not absurdity. The “Cowboy Mayor”, as he was sometimes known, often appeared in an oversized Stetson astride a horse, or whirling a lariat. Earlier, before his first term as mayor, he’d launched a “scientific” expedition to the South Seas. He was, he said, going to search for a tree-climbing fish. As an earnest purveyor of this extravagant imbecility, he’d built a yawl, the “Big Bill” for the voyage. “I have strong reason to believe,” Thompson explained, “that there are fish that come out of the water, can live on land, will jump three feet to catch a grasshopper, and will actually climb trees.” In the South Seas these would presumably be palm trees, although the type of tree was not recorded. The seaborne expedition to record this piscatory marvel, however, never got beyond New Orleans, where perhaps its participants discovered alternative biological entertainments. After the crash of ‘29, Thompson faced Anton Cermak in the mayoral election. As mayor, zany yahoo and Depression demagogue come early, he proposed a seemingly unassailable plan for prosperity that included opening a thousand more speakeasies. His foreign policy plank would safeguard the U.S. from any sinister European influence. But he failed to account for Cermak’s cunning in melding machine Democrats, ethnic groups, and dissident Republicans into a potent adversary. However, many Chicago neighborhoods were rampant with prostitution and gambling that thrived under Thompson’s regime. It was estimated that Al Capone had contributed between $100,000 and $260,000 to Big Bill’s previous campaigns, and many Republican independents became disgusted with the crime and corruption, not to mention Thompson’s vulgarity and/or cockamamie schemes. And that was only 1931. To many, Vincent van Gogh is known as ‘that crazy artist who cut off his ear.” Lust for Life, the popular novelized life of the artist by Irving Stone, might not dissuade one from this summary. Nor would the stirring movie, which starred Kirk Douglas as the mentally-disturbed Dutch painter. Yet recent discoveries shed a new light on what happened that night of December 23, 1888. The incident occurred in the town of Arles, in Provence, and received notice by police and newspapers of the time. Out of this evolved the myth that Vincent, suffering sexual rejection at a local bordello, cut off the lower part of his left ear and presented it to a prostitute. First came the revelation by researcher Bernadette Murphy that, rather than slicing off the lobe of his ear, Vincent had actually severed the entire ear. Murphy found a drawing made by Vincent’s doctor, Felix Rey, that illustrates the actual cut. Newspaper reports of the time named the recipient Rachel, which survived in French historical records. Murphy’s research shows, however, that the actual person was Gabrielle Berlatier, an 18-year old woman living in Moules, a village near Arles. Rather than a prostitute, she worked as a maid in the brothel at 1 Rue Bout d’Arles. Earlier in 1888, Gabrielle had been bitten on her left arm by a dog that proved rabid. The injured arm was cauterized with a red-hot iron, leaving an ugly, disfiguring wound. Taken to Paris, Gabrielle was treated with a new anti-rabies vaccine at the Institut Pasteur, which saved her life. Apparently, the Berlatier family was forced to borrow the money for the expense of her trip and the treatment. Once recovered, she worked as a maid in the brothel to earn enough to repay the debt. Meanwhile, Vincent van Gogh had withdrawn to Provence to paint in solitude. During this period he suffered temporary bouts of delirium which interrupted his painting and caused social problems. In particular, he’d had heated disagreements with fellow painter Paul Gauguin who lived with him for nine weeks that year. An incident on the night of December 23, 1888 led to Vincent’s disfiguring injury of himself. This leaves the question: Why did he give his severed ear to Gabrielle Berlatier? It’s a 130-year-old mystery, though I think I understand. During his stay in Arles, Vincent painted “The Starry Night,” as well as the haunting interior of the all-night Café de la Gare, with its garish gas lights, pool table and dissipated patrons (“The Night Café”). These emotion-drenched paintings (and others) speak to the growing intensity that characterized Vincent—an irresistible, overwhelming fervor that he sought to represent on canvas. Of the Night Café painting, he wrote that it “is a place where you can ruin yourself, go mad, commit crimes.” He himself was fast becoming the victim of this fanatic vision. He’d seen Gabrielle scrubbing and sweeping, he’d noted her sweat, he’d seen her terribly disfigured arm. Following his self-mutilation in a fit of delirium that fateful December night, and overwhelmed with sympathy and compassion for Gabrielle’s situation and injury, he delivered his ear to her. Not a rational act, you say? No. He knew his condition was grave—only a few months remained before he voluntarily committed himself in 1889 to the mental facility at St. Remy. As once described by his own sister Elizabeth, he’d become “a stranger to himself,” a stranger whose irrational emotion forced him to donate a part of himself to a hard-working, innocent victim of a rabid dog. Dentists warn against picking your teeth with a sharp metal object. Then, when you’re in the dental chair, you open your mouth and they pick your teeth with sharp metal objects. My doctor used to be a plastic surgeon—this raised a few eyebrows. There were no dents, the tires looked passable and it was cheap. Although the car was old, Dad seemed to think the motor ran well, and the chrome bumpers were still fairly shiny. Naturally the tan upholstery was worn, there were some spots of rust, but I was still a teen, and as I said, it was cheap. This 1939 Plymouth coupe, its pointed front with horizontal chrome accents, bulbous front fenders with embedded headlights, and swooping rear deck, looked good to me—in a word from the day, it was ‘streamlined.’ Chrysler called it a “business coupe,” so named for the cozy cabin and huge trunk space that took up all the space behind the front seat (I remember I could store a whole drum set back there). I decided to paint out the rust spots, and Dad supplied a can of maroon enamel oil paint and a couple of housepainter’s brushes. It never looked exactly professional, but at least it wasn’t rusty. Of course it had a 3-speed manual transmission, plus a 1939 innovation: the gear shift lever mounted on the steering column instead of on the floor! The car ran fairly well, considering the motor originally put out a not-exactly-staggering 82 horsepower. Plymouth called it “Floating Power,” an apparent reference to the support of the cast iron motor on rubberized mounts designed to shield passengers from the motor’s vibration. I guess it worked okay, although when you opened the hood with the car running, the motor bounced around so energetically it looked like it might lurch forward and jump right out of the car. The steering wheel, with its chrome horn ring, was pretty big, allowing for good leverage as there was no power steering in those days. The two-piece windshield had a wiper pivoted at the top center of each half. This seemed like a weak point, however, as I never could predict when the wipers would work and when they wouldn’t. It was great, just climbing on board and cranking up the coupe, trusting the wobbly motor wouldn’t shake itself loose and abandon me. And of course wishing neither rain nor snow might demand the swish of those sometimes “on,” sometimes “off,” windshield wipers. Yup, that was some car—my teen dream ride. A tip of the hat to those who took time to tell me how much they enjoyed the Publication Party at the fabulous Patsy Clark Mansion.